There’s a good article on the Macworld site that explains how to replace them with the higher bitrate. The Macworld tip is nice because it can also remove the low bitrate files for you. But not if you manually add/manage your music. Or, what if you want to keep them in the original location and move/remove them manually? This article explains how to do that. the script in this article is to be used before you delete the files from your local computer. If you read this article after you upgraded and the low bitrate files are still there, then use the script on Doug’s AppleScript site. you only need to use the script in this article if you manually manage your music. If you let iTunes manage it, then it will automatically place the low bitrate file in the Trash as part of the delete process. When upgrading tracks, iTunes offers to put the original low bitrate files in Trash afterwards. But: only for music managed by iTunes. Music that is manually added is not placed in Trash. How to find these files after the upgrade? Or, it can be that you want to make a backup of these low-bitrate files, or remove them manually. The AppleScript on this page will rename these files so you can find and remove them easily. The filenames are changed, this is harmless and afterwards you can still play the files in iTunes. If you change your mind, run the script again to undo the renaming process. 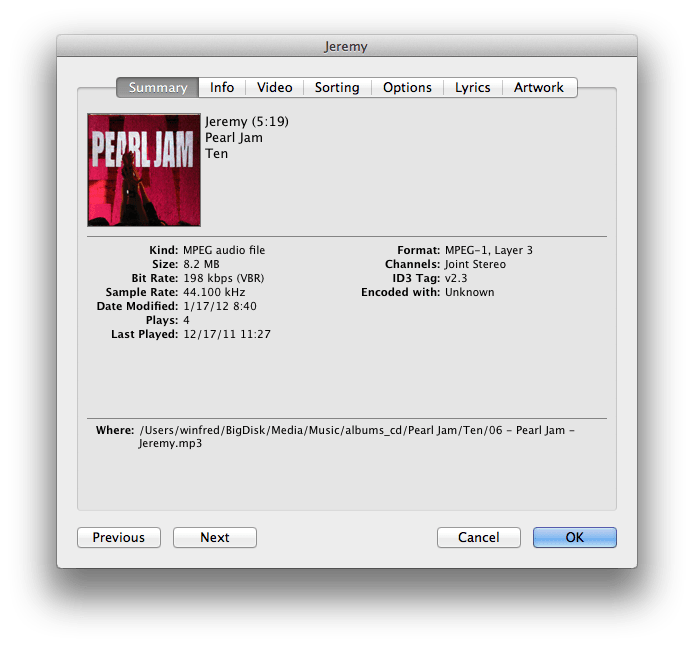 The script will go through all the tracks in the smart playlist that you created, and rename the file by adding a prefix (e.g. “_iCloudUpgrade_ “). After the upgrade you can then use Finder to search for that prefix. Those are the original low bitrate files that have now been replaced in iTunes by the high bitrate version, and you can safely delete (or move) these files. If you want to take a look at the script instead of / before downloading it, here it is. 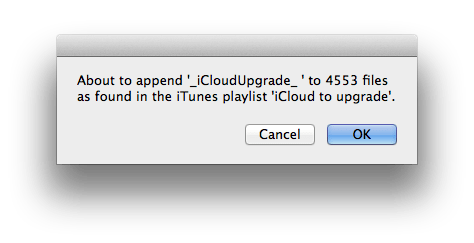 property iCloudPlaylist : "iCloud to upgrade"
property iCloudPrefix : "_iCloudUpgrade_ "
display dialog "About to append " & quoted form of iCloudPrefix & " to " & myCount & " files as found in the iTunes playlist " & quoted form of iCloudPlaylist & "." 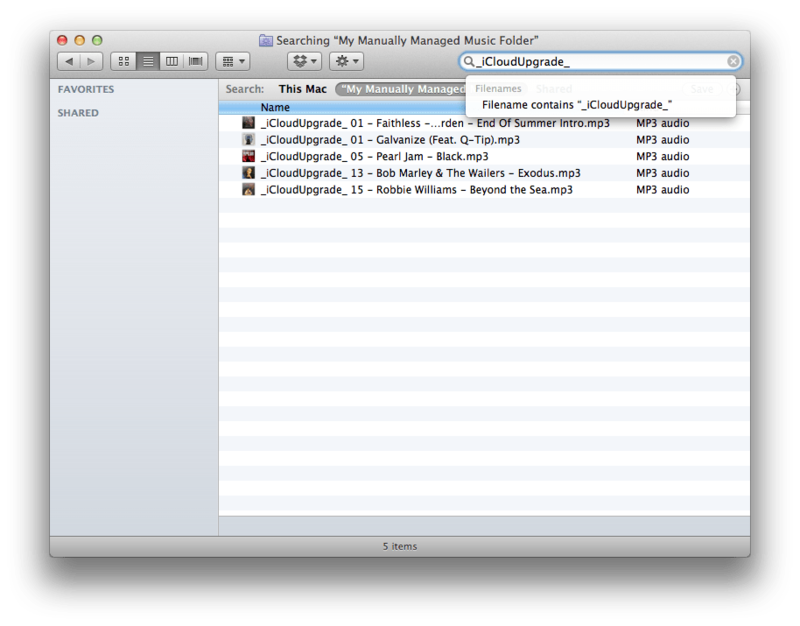 The whole point of using iTunes is media management. Manually managing media just seems like such a pointless exercise. Media management is not the same as file management. 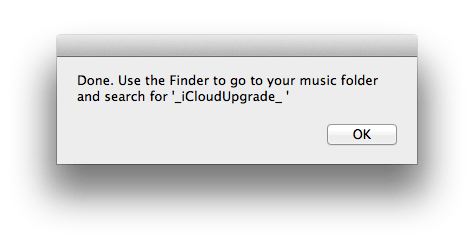 I did not want iTunes to delete my original files, so I could back them up, and I did want to be able to identify + find the original files easily.